With the US market somewhat spooked by an AH drop in the China market, the VIX opened higher, and climbed into early afternoon, settling +10.2% @ 13.89 (intra high 15.02). Near term outlook is uncertain, and will be seemingly dependent upon how China trades next Monday. *a net weekly gain of a rather significant 10.4%, but still in the sub teens. It is notable that at the current rate of turn, the VIX weekly will be offering a possible bullish cross in about 3 weeks time. Certainly, the equity bears will have a better opportunity from mid May onward.. a seasonally weaker time of year. 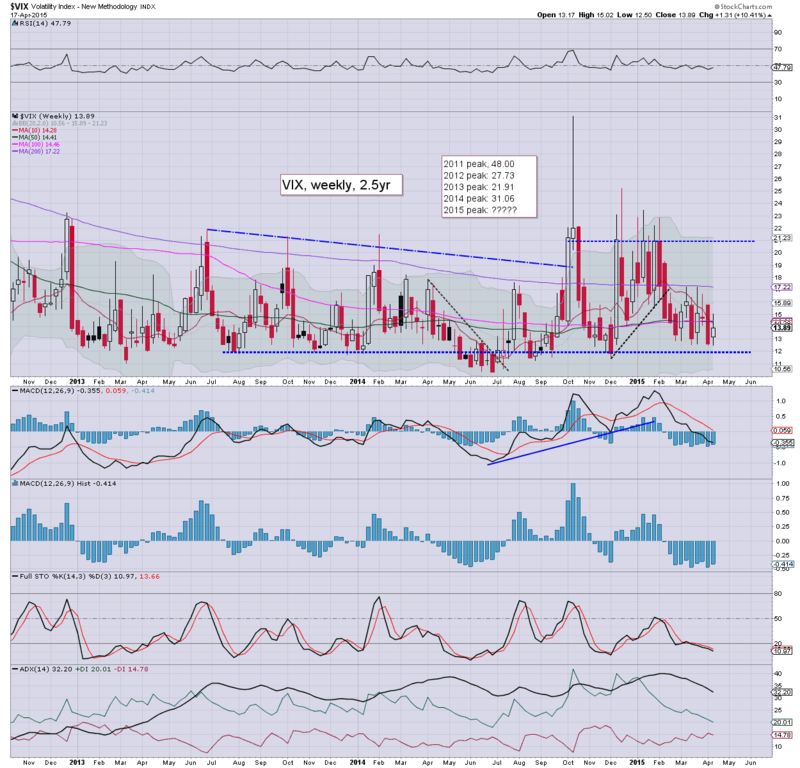 For the moment, the key VIX 20 threshold looks out of range at least until mid May. US equity indexes closed significantly lower, sp -23pts @ 2081 (intra low 2072). The two leaders - Trans/R2K, settled lower by -0.7% and -1.6% respectively. Near term outlook is now very uncertain, not least with the China market set to see a major opening Monday decline of 5% or so. ... and yet another week in the world's most twisted casino comes to a close. 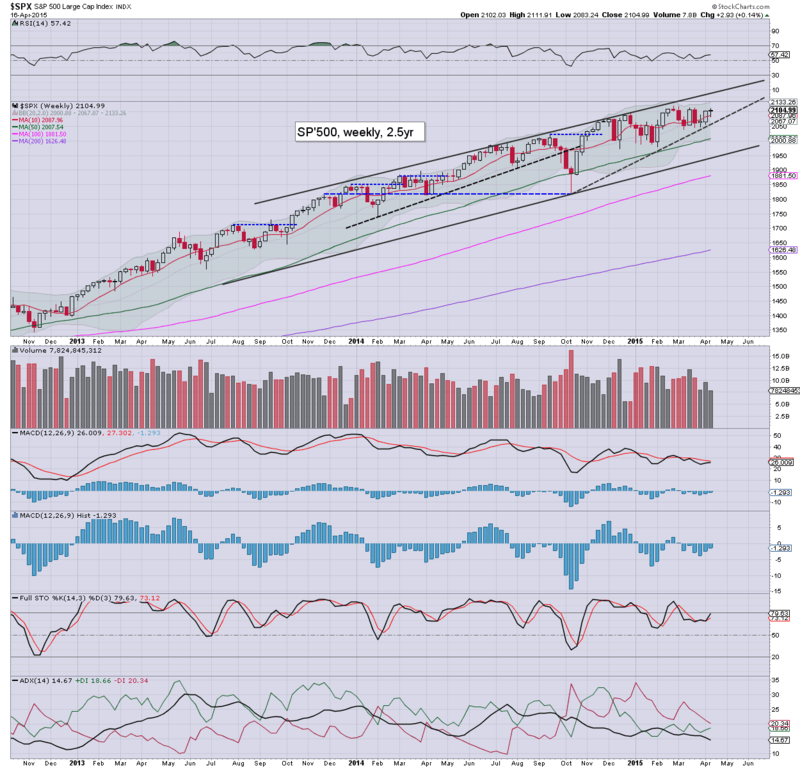 The two week run for the bulls is over.. .with all indexes seeing somewhat significant net weekly declines. However, until the recent low of sp'2039 is taken out.. this is much the same style of price action that we've been seeing since the start of the year. Equities remain broadly weak, with significant declines across all the main indexes. The sp'500 is set for a net weekly decline of at least 1%. VIX is confirming some moderate market concern about the China market.. and a possible GREXIT in May, +17% in the 14.80s. The daily candle is a pretty fiercely bearish one, but still... we've seen many such significant down days this year.. and yet the market is STILL breaking new historic highs. Seasonally, the bears don't have much chance of sustained multi-week down cycle until at least early May. Well, its the closing hour of a week, and regardless of the exact close.. it will have been one for the bears. notable strength: NFLX +0.7%.. which is pretty incredible, considering the monstrously huge Thursday gains, and with the main market as weak as it is, but hey... at a PE in the 250/275 range... whats not to like? 3.22pm.. minor up cycle.. but there is hourly resistance at the 10 MA of sp'2088.. which looks out of range into the close. 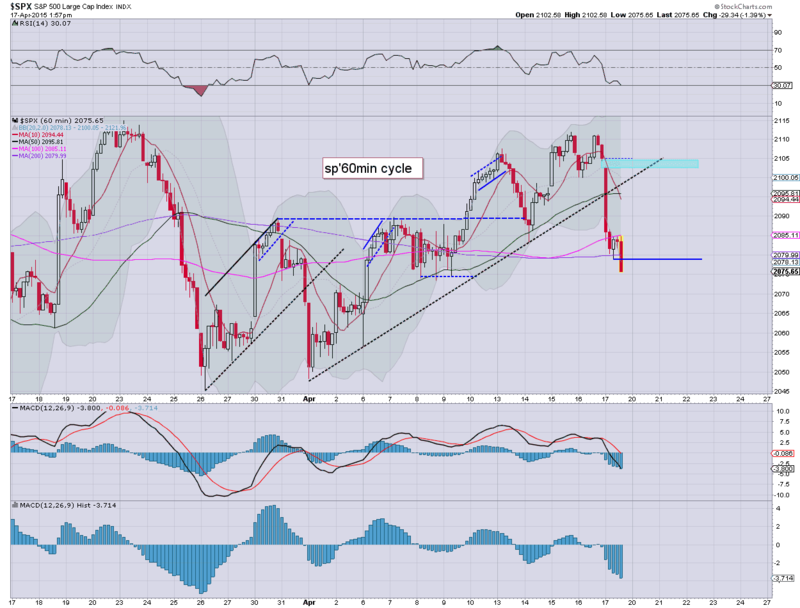 US equities remain significantly weak, and have just taken out the earlier low of sp'2079, next support is around 2072/70. VIX is breaking higher, +15% in the 14.50s. Next resistance (daily cycle) is 14.75/15.25 zone. Oil continues to cool, -1.2%. Well, we have just two hours left of the trading week. It remains notable that despite today, we've seen new historic highs (if marginal) in the R2K and NYSE comp' this week. Equity bulls are so far unwilling to pile back in. This is somewhat understandable, as China will probably open sharply lower next Monday. 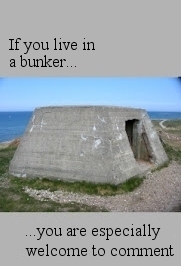 There is also the 'who wants to hold long across the weekend?' issue. 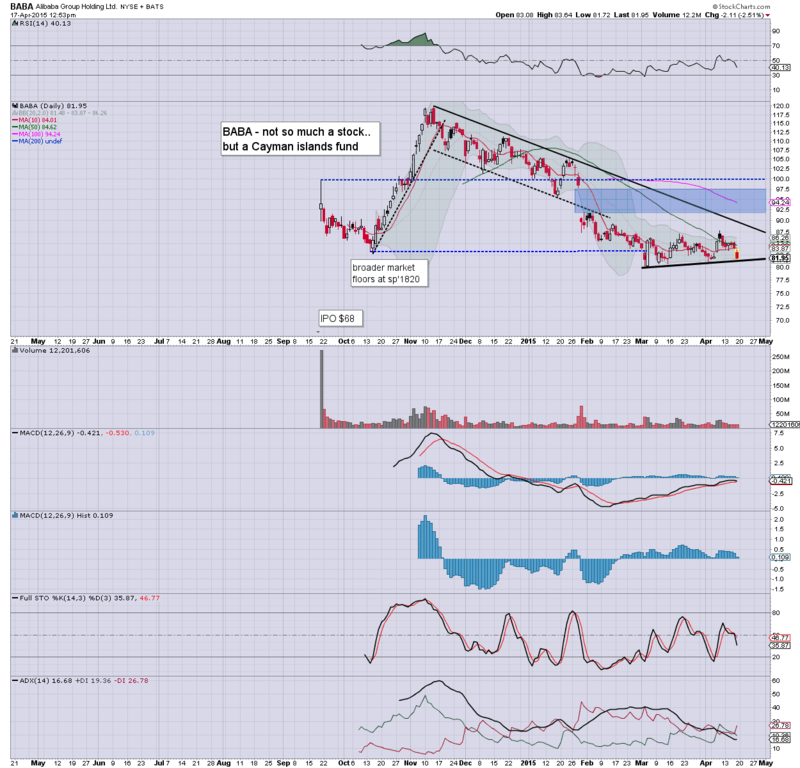 notable strength: STX +4.3%... post earnings... and a technical breakout above the 50dma. 2.24pm...things are so bad.. even NFLX is in danger of turning red! Clearly, a day for the bears.. and they (largely) have the Chinese leadership to thanks. Reminds me of SINA last week, where the China Govt' threatened them with a shutdown for not censoring enough. VIX breaks a new cycle high of 15.02, but then.. that is still a bizarrely low level.. the big 20 threshold looks a long way up. US equities are battling to build a floor, having seen an intra low of sp'2079, with VIX 14.44. There is viable moderate upside this afternoon, but with it being opex... the market looks certain to see a net weekly decline for all indexes. Oil is slowly sliding, -0.8%, but still hugely net higher on the week by around 8%. We have an interesting afternoon ahead. As ever.. since its opex, expect increasing chop into the weekly close. Hourly MACD (blue bar histogram) cycle is clearly on the very low side. On any basis, the bulk of the declines in this down wave are complete. If BABA falls much lower than $81.. it opens the door to the IPO price of $68. US equities are battling to put in a floor of sp'2079 (notably under the 50dma).. with the VIX maxing out around hourly cycle resistance, at 14.44. 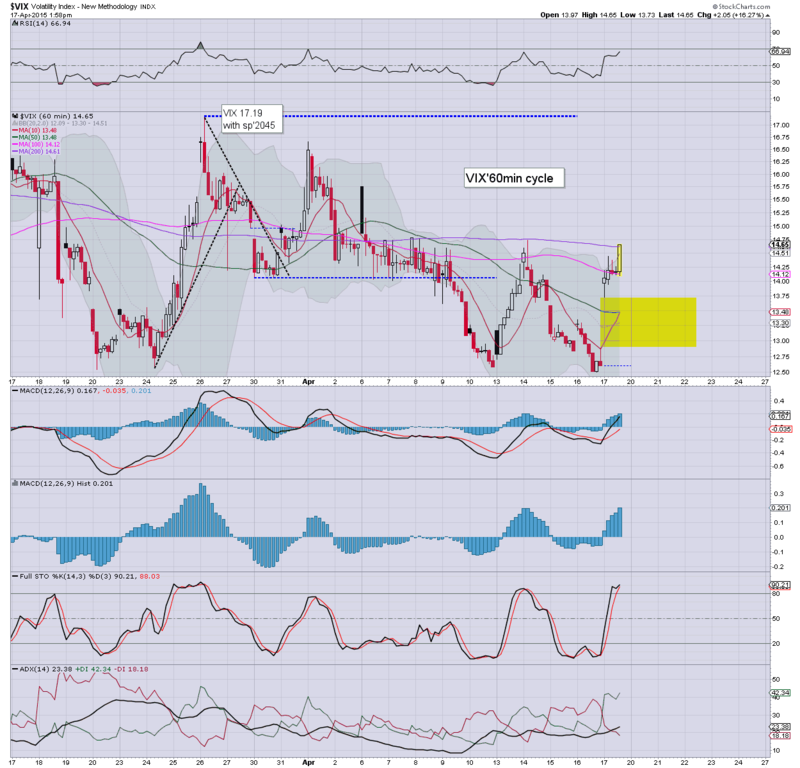 Metals are holding minor gains, Gold +$4. Oil is cooling, -0.7%.. but still higher by around 9% this week. So... a viable floor of sp'2083.. but clearly... its going to take some hours to get any reasonable clarity. Frankly, the equity bears should be in the process of getting short-stopped out. 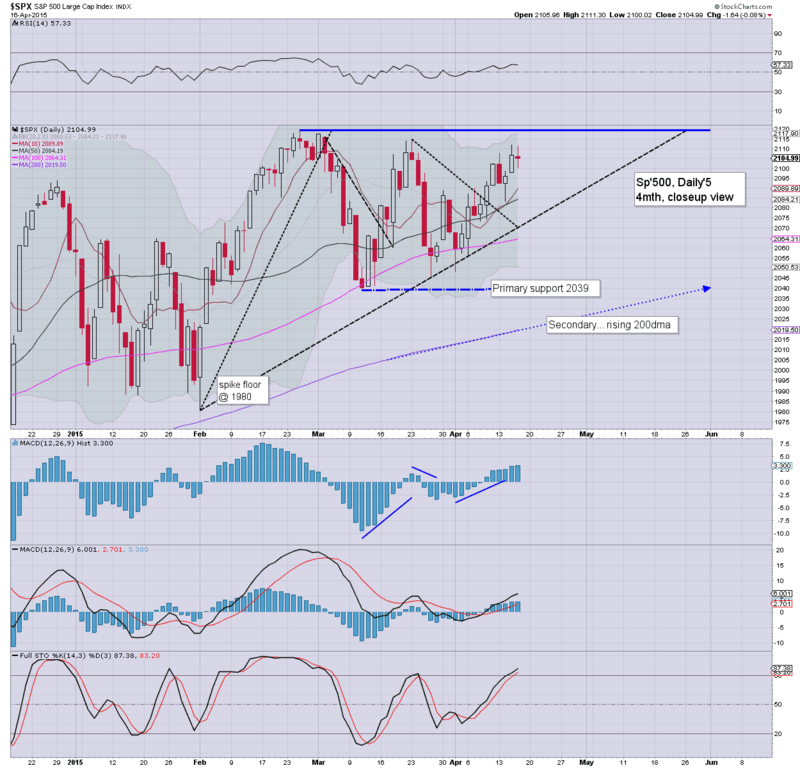 One day of weakness - due to EU/Asia market concerns, does not negate the broader US trend. 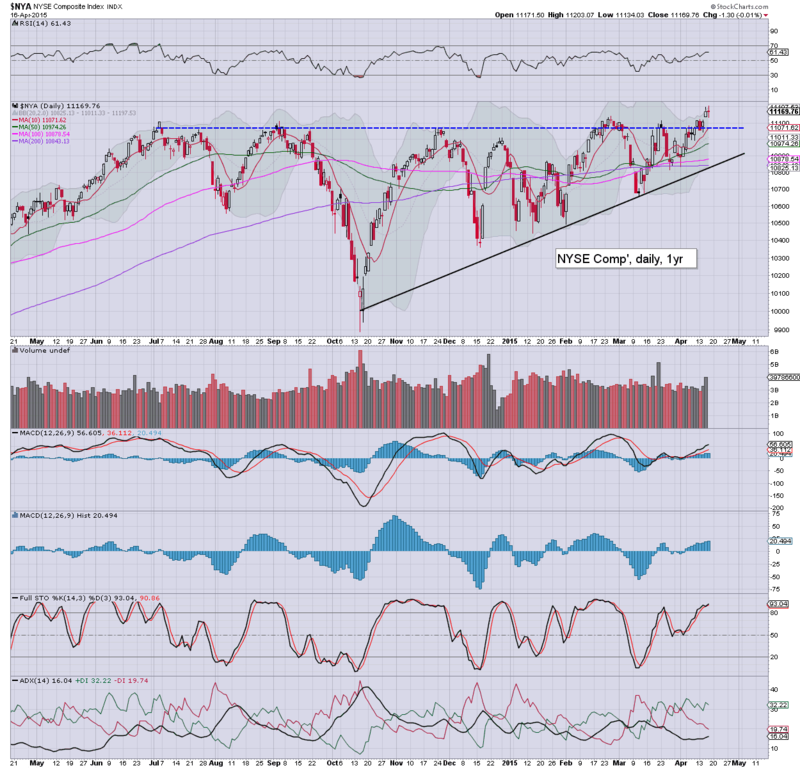 Did we already forget the R2K and NYSE Comp' were breaking new historic highs this week? US equities remain significantly lower, but as ever.. in this twisted market, a latter day recovery is often the case. Metals are holding moderate gains, Gold +$5. WTIC Oil remains strong, +0.2% in the $58s.. currently a net weekly gain of around 9%. Well, 11am is a typical turn time.. not least on mornings like today.. those few who were short overnight should at least be tightening their short-stops this hour. Best guess... the declines will be cut in half into this afternoon, although since its opex... it'll more likely be choppy... stuck in the sp'2085/95 zone. 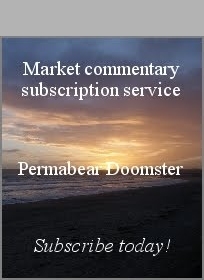 *Yes, the China market will remain a concern across the weekend, currently set to drop around 5% at the Monday open. 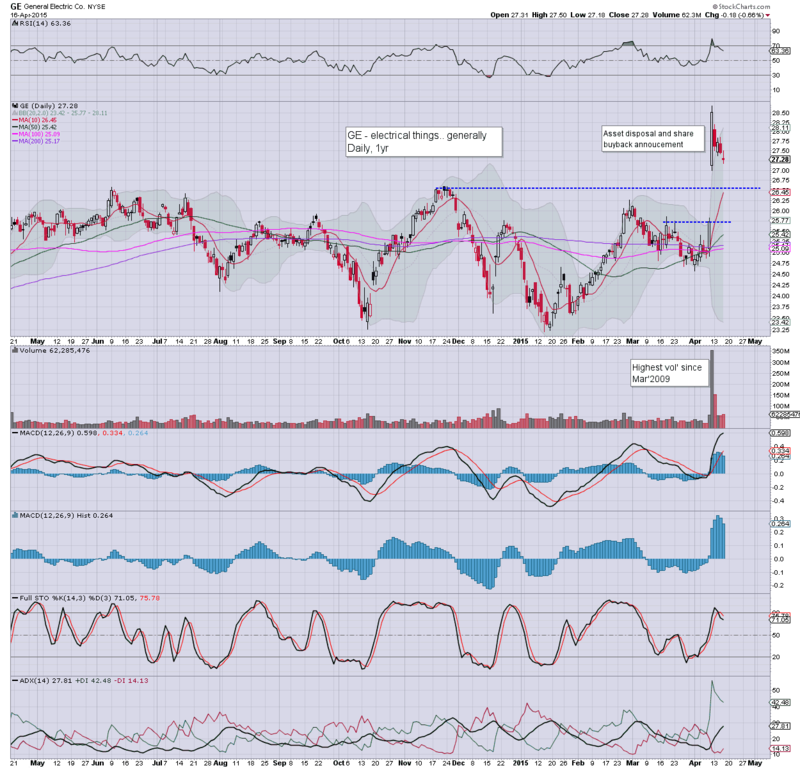 notable strength: STX +3.6%... on earnings, EPS $1.08... as it continues (like many) to buy back its own stock. 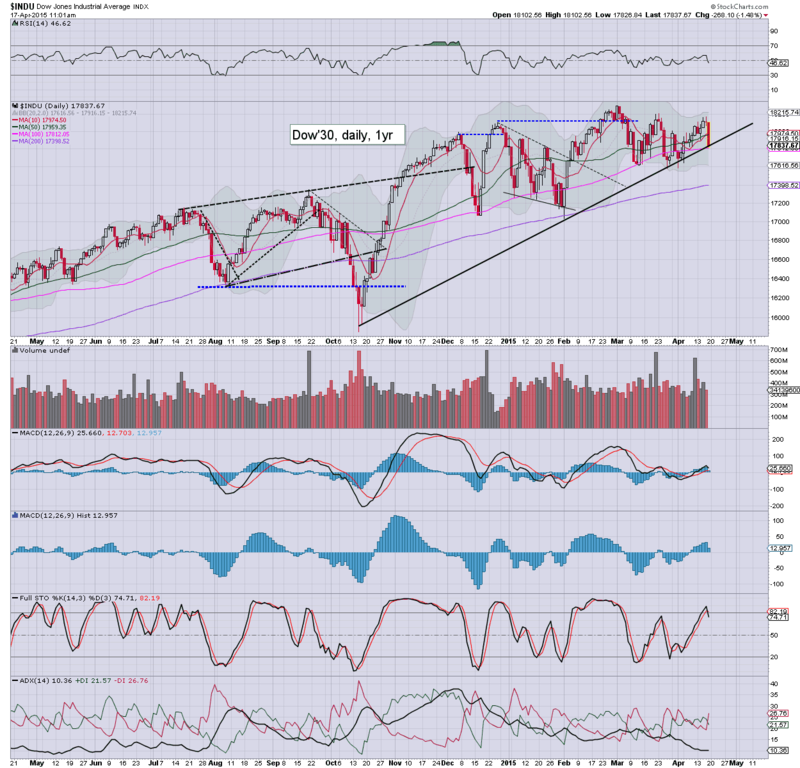 11.02am.. Dow needs to hold the 17800s... or another 200pts lower.. by late Monday. If we don't get a reversal higher today, then the key level for next week will be 17600.. where there are lots of recent spike floors. 11.11am.. tentative signs of a turn... on the micro 5min cycles. 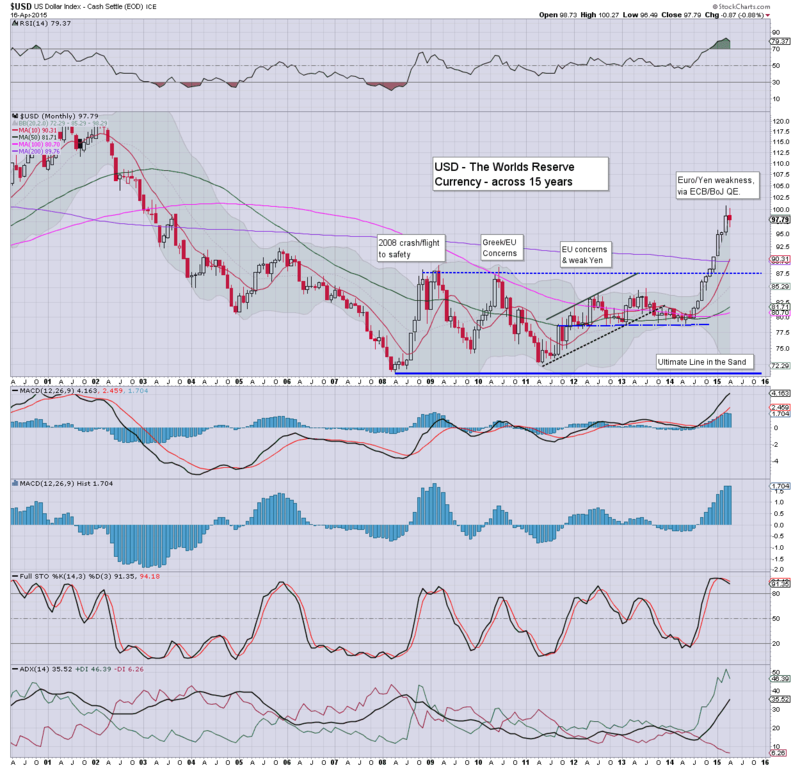 After this mornings surprise drop, is it time one of the fed officials appeared to issue a threat of QE4? US equity indexes are significantly lower, with a clear break of short term rising trend... market is already testing the 50dma of sp'2085. 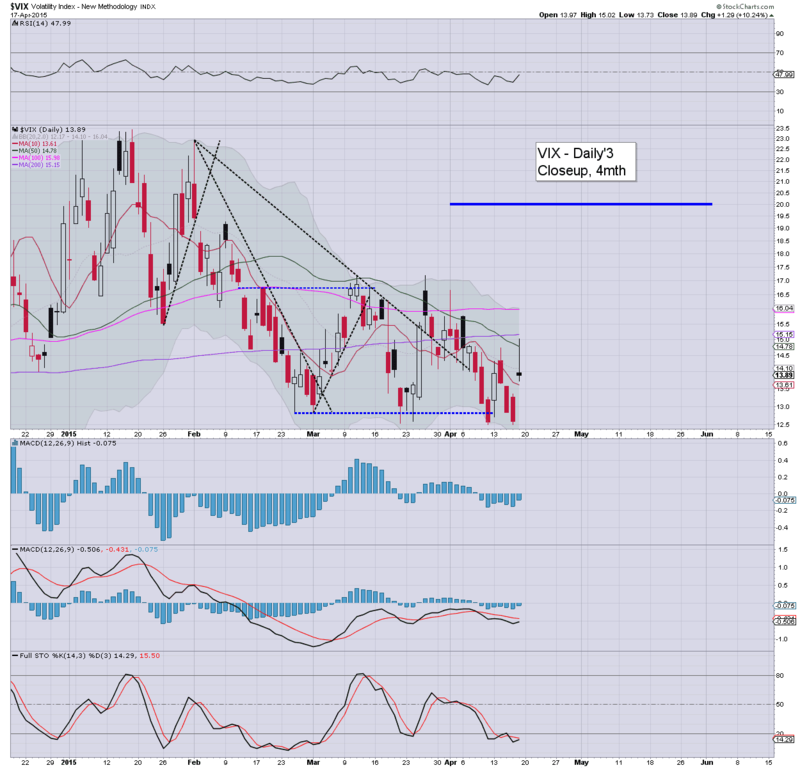 VIX is confirming the equity downside, +11%... but still only in the low 14s. Metals are a little higher, Gold +$5. Oil has already turned positive, +0.1%. So.. we're lower, and now its a case (as ever) as to what degree of latter day recovery we will see. Clearly, a net gain is going to be difficult... not least since its opex. VIX is clearly at resistance on the hourly cycle, it will be difficult to break/hold above 14.30.
notable strength: GE +0.8%.. after reasonable earnings. Perhaps most bizarre... NFLX continues to climb, +2.3% @ $575. Good morning. Futures are moderately lower, sp -12pts, we're set to open at 2093. Metals are bouncing, Gold +$6. Oil is a little weak, -0.5%.. but will certainly be prone to turning positive in the afternoon. *Equity bulls need a weekly close of 2102.07 for a net weekly gain, that still looks very possible. So.. we're set to open somewhat lower, but its opex today, and it'd be very surprising if we close significantly lower (as in <sp'2085). The broader trend remains very strong - as especially seen in EU/Asia markets, with the sp'500 set to break new historic highs before end month. GE results: EPS (pre items*) 31 cents (33 cents previous year) vs market exp' of 30. Rev' was a major miss, $29.4bn vs market exp' of $34bn. So... roughly $1.25 EPS a year, giving a PE of around 21... somewhat above the market average. Regardless, with a monstrous stock buy back of $50bn, along with the planned asset disposal of GE Capital (should raise around $25bn), the long term outlook appears fine. *GE wrote off $16bn from GE capital.. so.. technically, a Q1 loss of $13.6bn... $1.35 a share. As ever.. the finer details are always important to consider. In early trading the stock is lower by -0.5% @ $27.15. 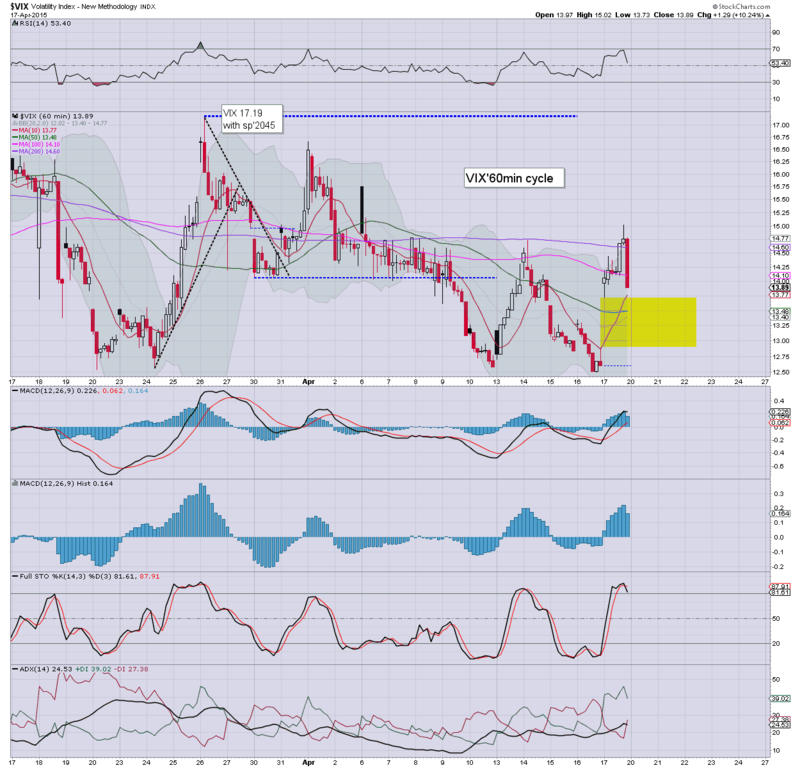 There is extremely strong support in the $27.00/26.50 zone. Under no fair outlook can I see GE sustainably trading <26.50 any time soon. GE has already turned positive, +0.6%.. as the buyers are starting to appear in the low $27s. 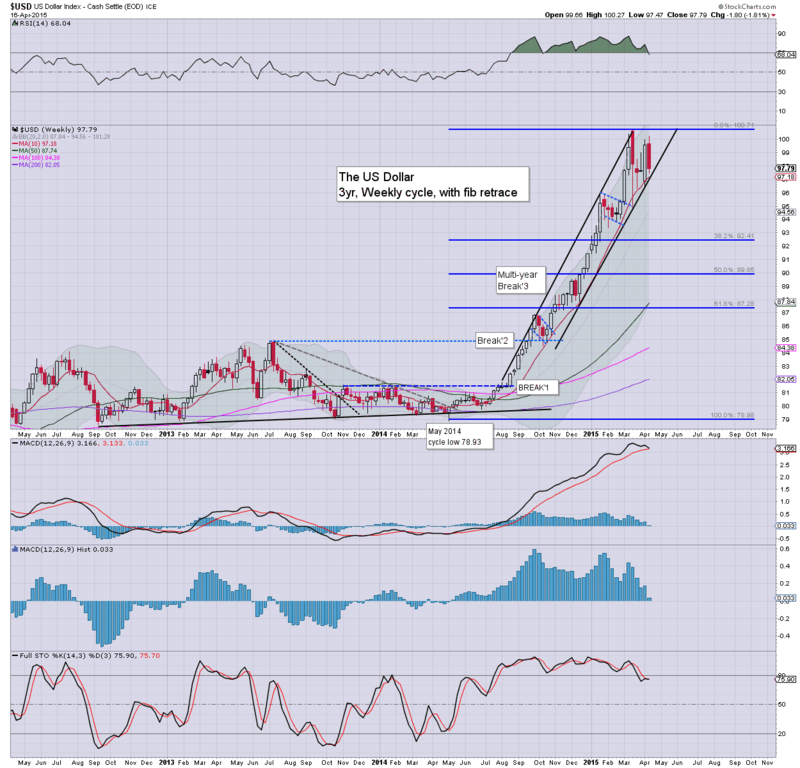 Having ramped last May - from DXY 78.93, to a March high of 100.71, the USD continues to look vulnerable to a significant retrace. A break into the 96s would break the rising trend, and offer 93/92 by June. Regardless of the exact retrace... broader upside to the 120s looks due later this year. ... I'm tired.. so this needs to be brief.. I am seeking a USD retrace to the low 90s... then soaring to the 120s.... the latter of which seems possible this year.. if a retrace is complete by June/July. If we do see the 120s - especially if it occurred quickly, would surely result in a broader capital market shock. 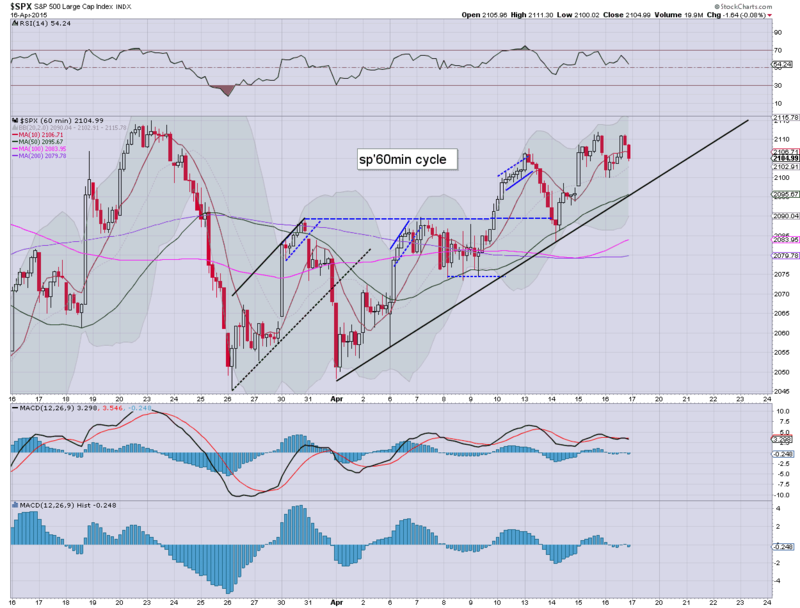 Oil and the precious metals would be under renewed severe downward pressure. Even the broader equity market would be hit.. although whether it'd lead to the long awaited 10%+ correction is difficult to guess right now. Anyway.. first things first.. lets see if we can get the DXY 96s next week.. and then fall for another month or two. Econ-data - CPI, consumer sentiment, leading indicators. It will be opex.. so expect some increasing chop into the weekly close. There is little to note, on what was a quiet day of minor price chop. 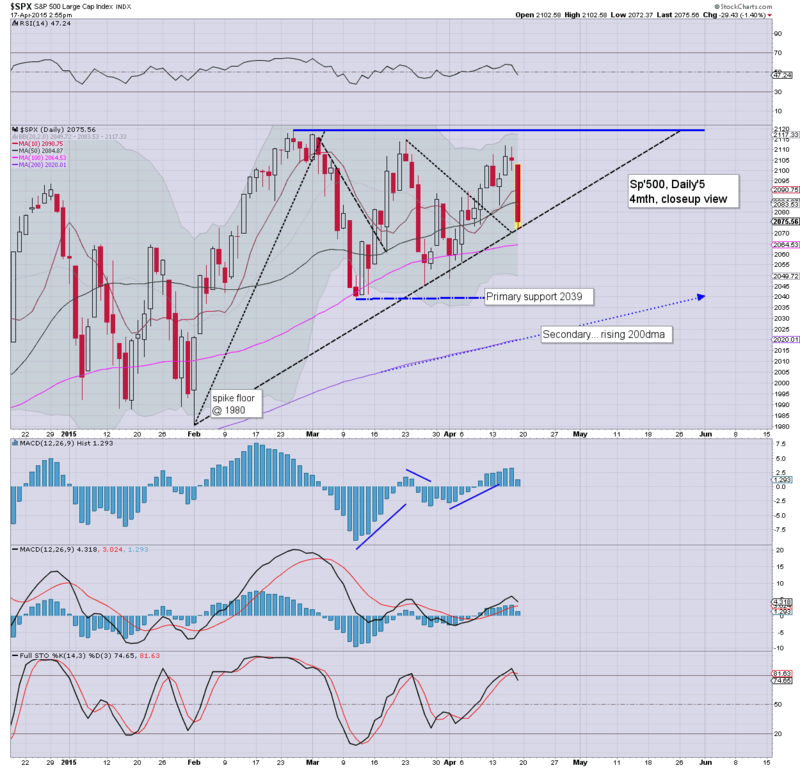 It would still seem the sp'500 will be trading in the 2120/30s within the near term. Whether the market can keep on pushing.. to the 2170/80s by June... difficult to say.